I recently finished reading Eric Metaxas’ superb biography on Dietrich Bonhoeffer, and it’s generated a lot of thoughts on two fronts. For one, his life is a fascinating and convicting example of what it looks like to be a disciple of Jesus Christ in the midst of extreme situations (i.e. the rise of Nazi Germany and the atrocities of the second World War). I’d argue that reading biographies like this is a good practice for believers not because we are idolize those whose lives seem “extra-saintly”, but because they can spark deep gratitude to God for how he has chosen to use the lives of his servants for his glory and also encourage and convict us in our own lives as disciples of the Risen Lord. The other main front on which this book has stimulated my thinking relates to Bonhoeffer’s theology. While I’d say that I had read a decent amount of his work prior to this, I’d also say that Metaxas’ analysis of Bonhoeffer’s thinking and how it grew out of and reacted against his own theological context was quite insightful. Because Bonhoeffer’s work is relatively small in quantity and because much has been read (or misread) through the lens of some of his occasionally obscure prison letters, his work has often been held up and trumpeted by diverse and conflicting theological programs. I’m working through some thoughts on this that I plan to include in a later post. In Jesus Christ the reality of God has entered into the reality of this world. The place where questions about the reality of God and about the reality of the world are answered at the same time is characterized solely by the name: Jesus Christ. God and the world are enclosed in this name…we cannot rightly speak either of God or the world without speaking of Jesus Christ. All concepts of reality that ignore Jesus Christ are abstractions. As long as Christ and the world are conceived as two realms bumping against and repelling each other, we are left with only the following options. Giving up on reality as a whole, either we place ourselves in one of the two realms, wanting Christ without the world or the world without Christ–and in both cases we deceive ourselves…There are not two realities, but only one reality, and that is God’s reality revealed in Christ in the reality of the world. Partaking in Christ, we stand at the same time in the reality of God and in the reality of the world. The reality of Christ embraces the reality of the world in itself. The world has no reality of its own independent of God’s revelation in Christ…[T]he theme of two realms, which has dominated the history of the church again and again, is foreign to the New Testament. –Dietrich Bonhoeffer, Ethics, vol. 6, quoted in Metaxas, p. 469. Jesus Christ is not some privatized, internalized “Savior principle” that remains isolate from or irrelevant to the secular world. Indeed, as Bonhoeffer would indicate, there is truly no such thing as an irreligious reality, but only that reality that is grounded in Jesus Christ, the one through whom, for whom, and by whom all things were created (Colossians 1:16), and the one who “upholds the universe by the word of his power” (Hebrews 1:3). 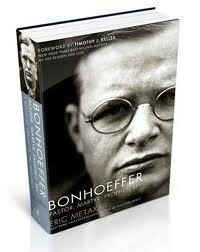 This is the Christ for whom Bonhoeffer lived and died.